I just finished reading the Millionaire Fastlane by MJ Demarco. I’d been looking forward to reading this and was excited to see it was a free giveaway from the Financial Blogger Conference. A lot of people are skeptical about this book. After all, the title makes it sound like a “get rich quick” book, which it is, in a way. MJ calls himself the “anti-‘get rich slow’ guru.” But he’s not a scammer, not selling crappy products to get rich fast, and he’s successful millionaire (and not from selling “get rich quick” books and the like). I’m not 100% focused on money by any means, but I’m almost always focused on living a remarkable life and not getting stuck in the grind forever. That said, I was pleasantly surprised with this book. MJ points out that there’s simply no way a 9-5 job can lead to real wealth. The numbers just don’t work, and he proves this in a variety of ways. You can be a millionaire within 10 years with extremely hard work. I liked this point specifically because a) it’s realistic since it’s not promising riches tomorrow and b) it sounds much more promising and exciting than working a 9-5 for 40 years before retirement. “Do what you love” alone simply doesn’t work for building wealth and success. Many “businesses” are just like being enslaved at a job and are reliant on time. Sure, you can chase your entrepreneurial dream and open up a coffee shop or restaurant franchise, but you’ll still be putting in hours for limited wealth. “Slowlane” jobs have limited leverage available to accumulate wealth. As you can probably guess, there book doesn’t lay out specific ideas for how to get rich. But that’s not what I was looking for nor expecting anyway and would be a lot to ask out of a $15 book. However, I really enjoyed the the main message of the book: everyone who goes through life working at a job and funding 401ks is traveling through life in the “slow lane.” But business owners who are “producers” leverage their time and money more effectively to get in the fast lane. MJ tells us a bit about how he got to where he is (although his story is a bit vague). He’s very careful to point out that it’s not easy and not quick, at least not in the sense that it will happen in mere weeks or months. I found this advice to be realistic, and if nothing else, this book will definitely make you think and get in the mindset of how to get ahead rather than just settling into the status quo. What can you do with what’s in this book? Realizing that jobs aren’t the path to (quick) wealth and seeing the math to prove it. MJ is extremely critical of jobs, working the 9-5 for 40 years, and banking retirement on the stock market. He also uses a lot of great examples of how it’s simply impossible to get ahead living a workaday life and investing in the stock market, and he’s right. If you want the cold, hard truth about working for a salary for the rest of your life, MJ lays it all out there. 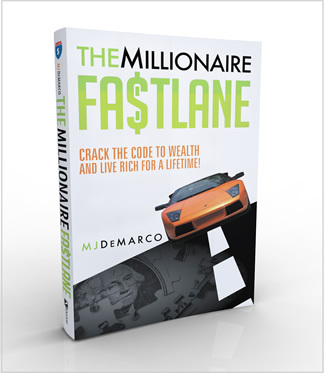 Adjusting mindset to get in the “fastlane” to wealth. MJ points to a lot of examples of how he and others have accumulated wealth at a rapid pace. He also shares examples of how to examines needs that others have and turn them into a product or business. Introducing basic business concepts and putting them into motion. MJ gives some background on structuring businesses, and he dispells some entrepreneurial myths and mistakes, too. I wouldn’t say this book totally passes the scammy/gimicky test. While I can’t prove it, I did feel like MJ wasn’t telling the whole truth with some of his stories as I got a bit of a “Rich Dad” type vibe from his writing style. While he doesn’t sell anything else directly from the book, MJ does plug his Millionaire Fastlane Forum often in the book (which is free but has ads). I’d say the book is definitely worth the $15 price tag or a borrow from a friend, so check it out! Pat at Smart Passive Income did a great podcast with MJ, so check that out, too. Thanks for honest review Jeffrey. I will wait till this is available in my library. I do agree, 9-5 is just not enough. There are so many other avenues to explore for extra income. You’re welcome! This book might not be interesting to everyone, but it’s worth checking out. I’ve got to be honest with you – I got a fair way through the book and gave up. Whilst he did have some things of use to say, for the most part he just appeared to be regurgitating the same information. Plus he did tend to come across as loving himself just a little *too* much. So did I miss anything in the last third of the book? I def agree with your points. Actually, I thought the material towards the beginning of the book was better and it got a little boring towards the end. I’m pretty into the persona finance realm, so maybe I’m just naturally more interested in this material. I read this book after the conference and liked it a lot. I thought it was a get rich quick book too and almost didn’t read it. But I loved his concepts and though the did a good job of motivating the reader to start thinking differently about their income. Oh I also wanted to say that a great follow up to this book would be E-myth revisited. Fastlane Millionaire is the why, e-myth is the how.